Smorgasburg Queens, the latest and highly anticipated expansion of NYC's popular open-air markets, launches this Saturday in Long Island City boasting a kickass lineup of the borough's most exciting, exotic, and ethnic eats. Located in a cozy indoor-outdoor space at 43-29 Crescent St, this face-stuffing destination is decidedly different from its Brooklyn counterparts, focusing almost exclusively on Queens-based vendors -- from Georgian comfort food out of Rego Park to deep fried pudding, an Astoria favorite. We got a sneak peek at what they've cooked up, so you're prepared to dive in mouth-first this Saturday (and the Saturdays after that). 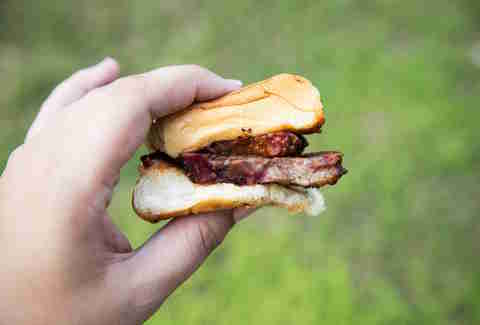 You know you're in for some damn good BBQ when a pit master piles the delicious all-wood smoked meat onto a plate right in front of you and the beef brisket sandwich we tasted from this Astoria-based caterer was no exception. The tender, fatty meat melted into salty, smokey goodness in our mouths and a little squirt of BBQ sauce added some good flavor, but it's far from necessary with this bad boy. 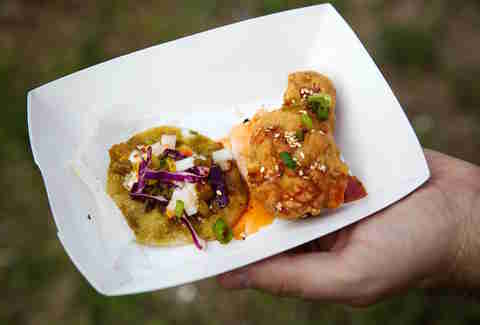 We got a big taste of Queens with these two little samples of Korean fried chicken wings and roti tacos, prepared by pair of chefs born and raised in the borough. The wings came gloriously fried and topped with our choice of the sweet and spicy sauce (you can also get a garlic sauce). The taco was flavorful chicken perfection via Indian roti. Eat both. We love tamales. 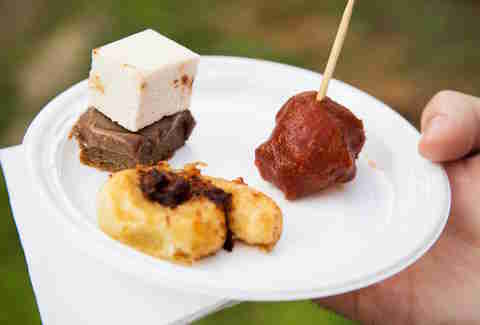 That's why we were thrilled to taste the Ecuadorian hallacas from Son. 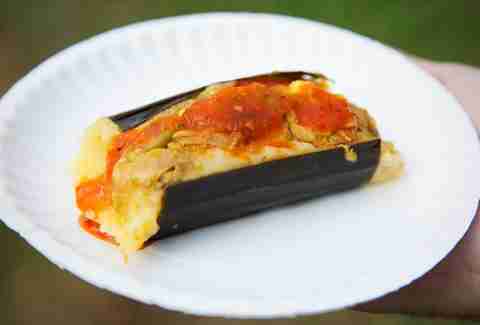 Similar to tamales, the hallacas are made with chicken and cornmeal dough, but are filled with a bunch of other goodies like olives, raisins, and more. Get it with the hot sauce on top. Come to this Astoria-based stand for the dangerously good bloody mary donuts, and stay for its other sweet and savory bites like the bacon jam sticky buns. Well, at least that's what we did. 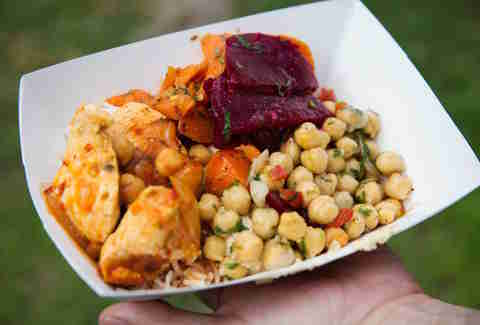 Haven't Made it to Smorgasburg? Here's Some of the Food You're Missing. 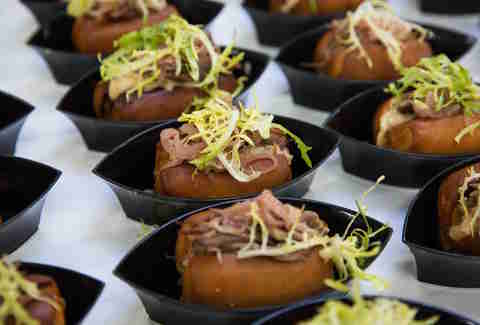 Hit up this stand serving a variety of rolls from Danny Brown's popular Forest Hills kitchen, like the lobster roll we sampled in miniature, which comes topped with duck confit. The flavor pairing is even better than it sounds. Trust us. Obviously, you should come hungry to a food market, but we recommend a hangry-level appetite when approaching this stand thanks to its incredibly satisfying comfort foods like meat dumplings, pickled vegetables, kebabs, and more. We had them stuff all of it into a serving boat and don't regret a thing -- well, except for not getting more of their killer fresh hummus. Eat as much of it as you can. 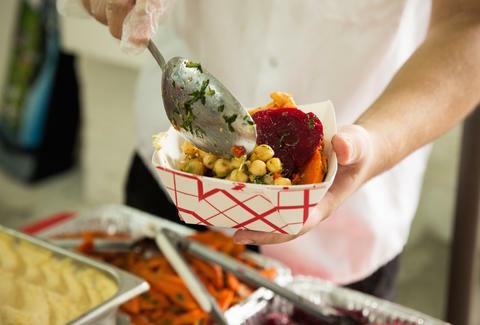 This vendor proves simple is delicious, even when surrounded by tons of other food. 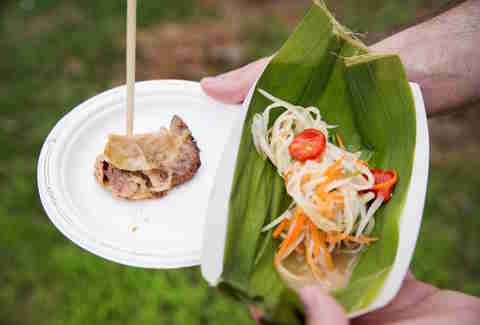 The menu consists of grilled chicken, papaya salad, and sticky rice. That's it. We tried the chicken, served at the end of a skewer, and the papaya salad and walked away pleased. 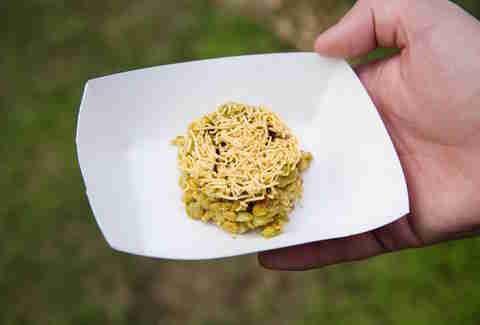 Stop and try this Jackson Heights-based caterer's super savory bites like bhel puri chaat, which packs a ton of delicious, spicy flavor and a nice little crunch. Follow it with one of their rich, chocolatey rum balls and you're set. 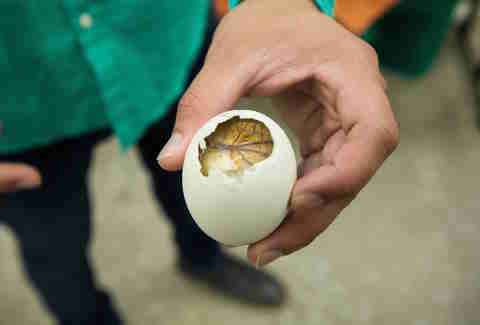 If you're looking for a true adventure at Smorgasburg Queens, head over to this Woodside neighborhood favorite's stand serving up balut, or a 6-day-old fertilized duck egg. We chickened -- or should we say ducked? -- out when offered an egg to try, but we witnessed a few other people eat them and somehow enjoy them. 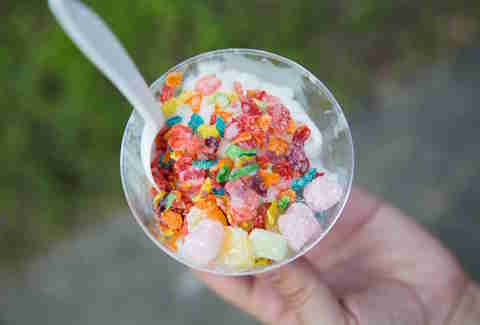 You absolutely must enrich your life with this stand's milky Taiwanese shaved snow that comes topped with mochi and "party rocks," or a ridiculous mix of Pop Rocks and Fruit Pebbles. It's like freaking disco cereal and it's spectacular. This Flushing-based dessert joint will take care of your dessert needs, Hong Kong style. 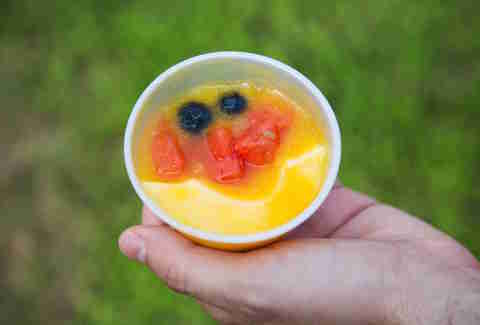 We were able to get our hands on samples of the mango pomelo soup, which is exactly as sweet and refreshing as it sounds. The pudding milk tea ain't bad, either. 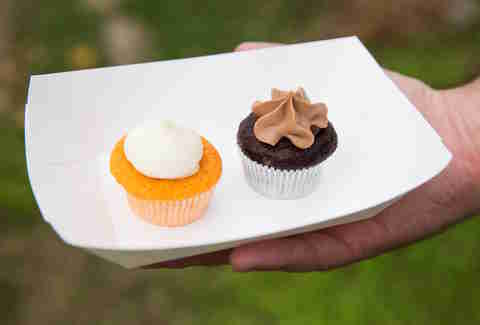 This Forest Hills-based bakery has got the sweets with mini cupcakes and normal-size cupcakes in all kinds of delightful flavors like Thai tea, raspberry buttercream, and more. We tried the Thai tea with condensed milk buttercream as well as the sriracha chocolate with chocolate buttercream mini cupcakes and were blown away. Of course, we didn't get to taste everything on the menu at Smorgasburg Queens, so you'll just have to get there and do it yourself. It's open for your eating pleasure on Saturdays from from 11am to 6pm. Tony Merevick is Cities News Editor at Thrillist and now lives dangerously close to this place, so goodbye diet aspirations. Send news tips to news@thrillist.com and follow him on Twitter @tonymerevick.